Former Senate Majority Leader Howard Baker Dies At 88 : The Two-Way Baker, of Tennessee, also served as President Ronald Reagan's chief of staff from 1987-88 and later as ambassador to Japan. 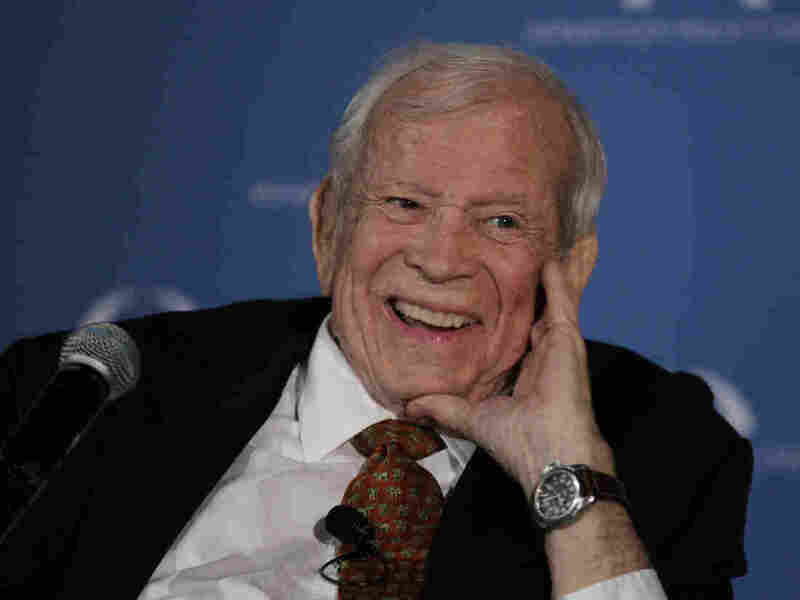 Former U.S. Senate Majority Leader Howard Baker looks to the stage during "A Century of Service" honoring him and Sen. Bob Dole at Mellon Auditorium, Wednesday, in March 2012. Baker's death was announced on Thursday. Tennessee Sen. Howard Baker, who served as Senate majority leader in the 1980s and chief of staff under President Ronald Reagan, has died at 88, his law firm said Tuesday. Baker died at his home on Thursday due to complications from a stroke he suffered on Saturday, according to the firm, where Baker was senior counsel. Baker's death was also announced on the floor of the Senate by Republican Leader Mitch McConnell, who called him "one of the Senate's most towering figures." The Associated Press describes Baker as: "The scion of a political family, Baker served 18 years in the Senate, winning widespread respect from Republicans and Democrats alike and rising to the post of majority leader." Baker, a moderate Republican, served on the Senate committee investigating the Watergate break-in in 1973. He was the one who posed the famous question - "What did the president known and when did he know it?" He ran for president in 1980 and "thought about it several other times," the AP notes. The Washington Post notes that Baker's "talent for compromise ... proved the undoing of his ultimate ambition — his own presidency." "[His] party shifted rightward and demanded strict adherence to conservative orthodoxy from its candidates for the White House," the Post writes. Although his tenure as chief of staff in the waning days of the Reagan administration lasted just a year and a half, he was later nominated as U.S. ambassador to Japan by President George W. Bush. He served in that capacity from 2001 until 2005. In 1966, Baker, was the first Republican to be popularly elected to the Senate from Tennessee, according to The Tennessean. He went on to serve 18 years in the Senate, including as minority leader before he became majority leader when the GOP gained control of the chamber during the 1980 elections.